Entering the school system for the very first time! Hostak, Henzl & Bichler S.C.
A Special Thanks to The Racine Public Defender’s Office who provided the most school supplies during last year’s effort! I’m told Legal Action of Wisconsin in Racine is going to give them some hot competition this year! Much Thanks to all of the Firms that have agreed to help this year! For those that may want to contribute but do not want a collection box, you can still help by sending a donation to the Racine County Bar Association care of Kelly Mould, 555 Main Street, Ste 260, Racine, Wisconsin 53403. Several of our members will be taking a shopping trip with the donation dollars to purchase school supplies! Volunteers Needed! On May 13th from 9 am – 2 pm Wills For Veterans will be holding a clinic to provide basic estate planning documents to veterans and their spouses. The event will be held at the Workforce Development building on Taylor Avenue. For those that have helped with Wills for Heroes in the past, this event will be administered in a similar manner. Attorney volunteers are needed to help individuals with their estate planning documents. This is done by entering the veteran’s information in to a document generating software program. No estate planning experience is necessary for this. (It is basically just data entry.) However, we also are hoping to have an estate planning expert who would be willing to be there for assistance. If you have any questions about the program, please feel free to contact Jim Brzezinski at 414-600-8064 or jim@tabakattorneys.com. If you are interested in helping please use the following link to register. https://www.eventbrite.com/e/wills-for-veterans-racine-county-veterans-service-office-tickets-33680471196 Thank you! MOUNT PLEASANT — Madison Attorney Dean Strang, made famous by the Netflix documentary “Making a Murderer,” on Wednesday implored local lawyers to work to address the social ramifications in the poverty in their community. 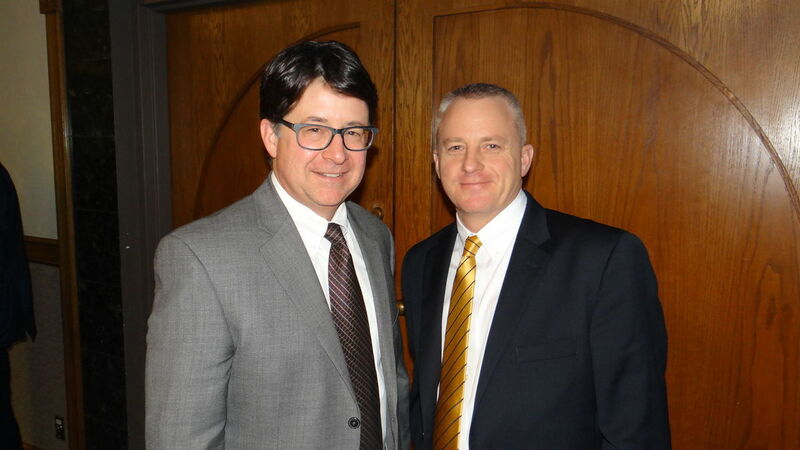 Strang spoke as a guest of the Racine County Bar Association Wednesday at the group’s winter dinner held at the Roma Lodge, 7130 Spring St. During the event, Strang announced that the defense team for Brendan Dassey is ready for oral arguments at the 7th Circuit Court of Appeals scheduled for Tuesday. In August, a federal judge overturned Dassey’s conviction for his role in the 2005 killing of photographer Teresa Halbach in Manitowoc County, ruling investigators coerced him into confessing. Wisconsin’s Department of Justice appealed that decision to the 7th Circuit. “We’re ready to go,” Strang said of Dassey’s defense team. “Making a Murderer,” which was a hit with viewers nationwide, depicted the pitfalls of the justice system through Steven Avery and his nephew Dassey’s 2007 trial for the murder of Halbach, a photographer for an auto marketing publication. Strang talked about the regrets he had after defending Avery, which propelled him into the national spotlight. Strang said at that point under Wisconsin law, the defense team could have requested a mistrial or substituted an alternate juror and they went with the latter decision. “These are the kinds of decisions you drive yourself crazy with the rest of your life,” Strang said. He continues to struggle with his own part in the case because he believed there was enough reasonable doubt in the case to acquit Avery. “I recognized then that there was some evidence supporting Avery murdered Teresa Halbach, but I’ve never been comfortable with the integrity of all of that evidence. And I’ve never been comfortable that in the end — that if I had been put in the position of a juror — I could have honestly returned a verdict of guilt,” Strang said. The cycle of povertyBut it was a message of addressing social challenges in society that was a key component of Strang’s talk Wednesday night. Strang challenged the Racine attorneys to be more active in their community and “work harder and care more” because of the “poverty of hope” that holds people back and contributes to crime rates. “They need to start thinking of poverty differently. It’s not just about how many nickels you have in your pocket,” Sprang said. He told the group how people have little ownership in the community if they’re impoverished in education, their spiritual life and even knowing their own family’s history and genealogy. Mentor and crusaderRobert Keller, president of the Racine County Bar Association, said he’s grateful Strang is willing to channel his talents and celebrity to strive for change in the criminal justice system. “Many of our attorneys in Racine know Dean, have worked with him or have been students of his in his various law school courses. We are grateful,” Keller said. One of those attorneys, Andrew Wier of the Mount Pleasant office of Habush, Habush and Rottier S.C., had Strang as an instructor at the University of Wisconsin Law School. “He is somebody who lives how he works. He cares and is extremely intelligent and he has walked the walk,” Wier said.